AV1 is a new media codec that is being integrated into various web browsers such as Mozilla Firefox or Google Chrome at the moment. The codec is developed by a consortium of companies and positioned as a royalty-free alternative to the non open codecs H.264 and H.265. Av1 promises smaller file sizes without impacting the quality of the video stream. Google published a test playlist of AV1 encoded and supporting videos on the YouTube website recently. The core idea behind the playlist is to give developers and users options to test the functionality, performance, and other metrics of AV1 encoded videos on the YouTube site. AV1 support is limited at the time of writing and preparations are in order to add support at this point in time. Chrome users need to run at least version 70 of the web browser, Firefox users at least version 63 of the browser. Firefox users need to modify a preference in the browser as well to enable Av1 support; this is done by loading about:config?filter=media.av1.enabled in the browser's address bar and flipping the preference to True with a double-click on the preference name. Note that YouTube may display the "you need" instructions for Firefox even if you have set the preference to True already. Load the Testtube page on YouTube afterward to enable support for AV1. Scroll down on the page until you come to the Av1 section on it. The AV1 video codec provides advanced compression, bringing you smoother streaming in HD and data savings for more video on the go. Because it is new, streaming AV1 in HD requires a powerful computer, and only some videos have AV1 available at this time. Choosing to stream AV1 in SD will use AV1 up to 480p, and VP9 for higher formats. The default setting is Auto but you may switch it to "Prefer AV1 for SD" or "Always Prefer AV1". 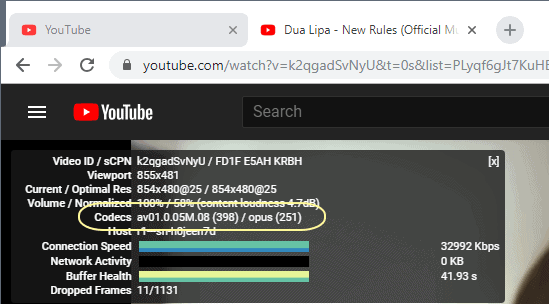 Note that Av1 playback requires a computer that is more powerful when compared to previous codecs that YouTube uses right now to stream videos to user devices. You could select "Always Prefer AV1" and see how well your device performs when you play videos on YouTube that support AV1. If playback is choppy or pushing the resources to a high level, you'd want to consider selecting "prefer Av1 for SD" instead which limits AV1 codec playback to 480p and lower resolution videos. Once you have made the selection you may point your browser to the AV1 test playlist on YouTube to start playback of videos that support the codec. You probably wonder how to find out if a video uses the AV1 codec or another for playback. You can find that out by right-clicking on the video and selecting the Stats for Nerds entry of the context menu. Check the Codecs listing; if you see av01 there AV1 codec is used. TheTrader, MindHunter, MusicX and 3 others like this. Only available in Dev or Canary editions on Chrome so far.